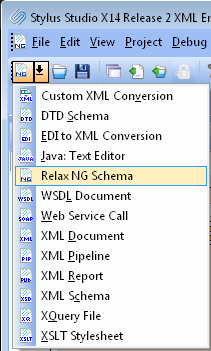 The Relax NG Editor shown below, which enables you to easily develop advanced data models expressed in Relax NG. 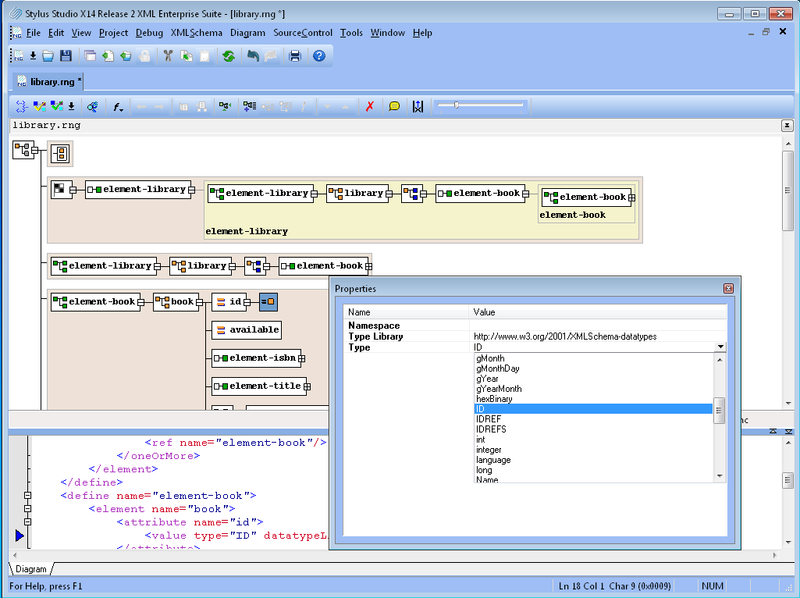 It is the only Relax NG Editor to provide a synchronized split-pane interface that simultaneously shows both a visual Relax NG Diagram and the underlying code, with changes in one pane immediately reflected in the other. 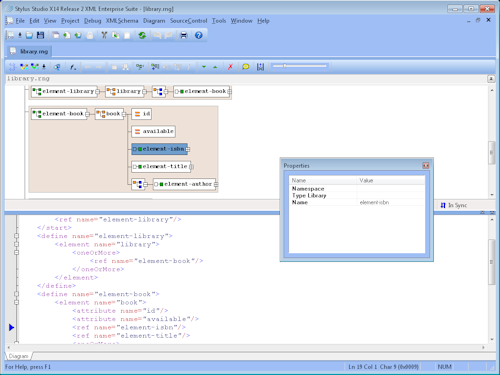 Stylus Studio® is the only XML IDE to provide synchronized Relax NG Text Editing and Visual Relax NG Diagram Views, providing you with the maximum flexibility in editing Relax NGs. 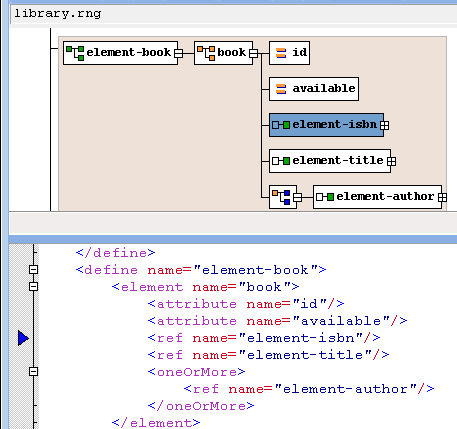 Any edits made to an Relax NG in the text editor are automatically synchronized with the Relax NG Diagram View, and vice versa. With round-trip engineering support in our Relax NG editor, there is no longer any need to switch back and forth between a schema's source code and graphical diagram — they are always kept in-synch, in real time. This powerful Relax NG editing metaphor is unique to Stylus Studio and is the most intuitive way to develop Relax NGs. Stylus Studio®'s Relax NG Design Window (illustrated below), allows you to view and edit any selected Relax NG component, such as global definitions. The Relax NG diagram can be expanded / collapsed by clicking on the (+) and (-) buttons. 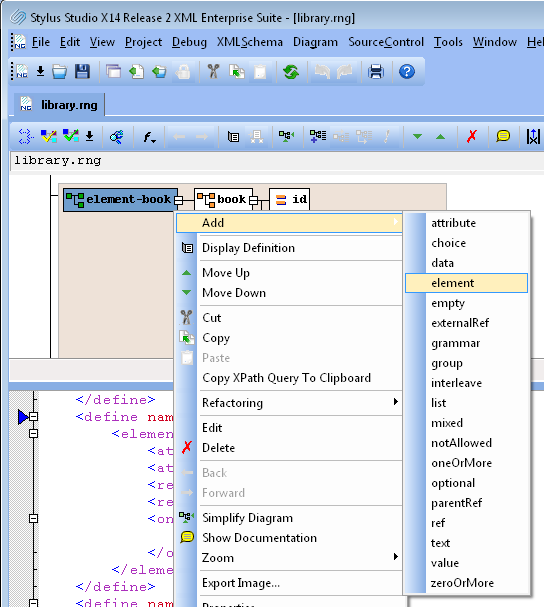 In the Relax NG Design Window, you can visually insert/append/delete compositors (oneOrMore, zeroOrMore, interleave, group, optional), insert XML elements and attributes, create element references, rename elements, etc. Support for drag and drop, copy/paste as well as undo/redo operations further simplify Relax NG Editing. A context-sensitive Relax NG properties window displays attributes about the selected Relax NG node. For example, you can specify the name, namespace, type, as well as any facets, etc. All of the Relax NG component diagrams can be saved to JPG files, just select an Relax NG Component, expand/collapse the diagram the way you want it to appear, then choose "Export as Image" from the Relax NG menu. Download a free trial of our award-winning Relax NG Editor today!